A Far Infrared Sauna is a device which uses Far Infrared wavelength Radiation rays in a closed space to initiate detoxification at a cellular level. As this takes place, the body perspires releasing toxins and allowing the body to get in balance and therefore go into healing mode. Each session can last from anywhere between 30 – 60 minutes. The skin is the body’s largest organ and functions as the third kidney of the anatomy. When the largest surface area of the body, the skin, starts releasing toxins through perspiration, one can only anticipate an effective means of cleansing to occur. Interesting to note, is the fact that many Swiss homes include a dry sauna and the very so called ‘common’ cold is far from common for the persons who make use of the facility. Now, similarly, persons who adopt a raw vegan diet reap simular immune system benefits; so why not enhance one's health even more by incorporating dry far infrared sauna sessions as part of one's regular protocols? In my mind, this is par for the course. Not all persons have the luxury of a home unit. Thankfully, however, many spas and wellness centers now offer this service at a cost which is often incomparable to the savings enjoyed by avoiding medical bills for ailments now considered ‘normal'. · Faster healing. – wounds etc. 'Historically, heat treatments have been used to help heal the body for thousands of years. 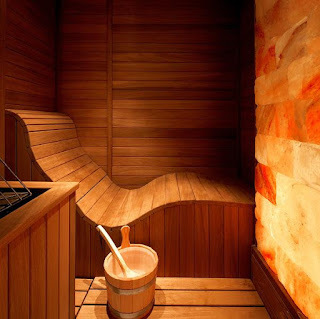 “Hot air baths” and sweat lodges were used for busting stress, increasing relaxation and detoxification among Native Americans, Eastern Europeans and in Ancient Chinese Medicine. Many years ago, before the invention of focused light therapy, basic saunas were created by building a fire directly under an enclosed sitting area. The “sauna” was heated with hot rocks and other materials burning on a fire that carried heat and smoke up to the lodge. The very exposure to these rays in a relaxed state and simultaneously hydrating for a fixed amount of time will be sufficient to assist the cells in their toxin release and to spur on perspiration/Far infrared waves penetrate into our body to activate the sweat glands. It is therefore important to shower right after a session, preferably in cold water to allow the skin pores to fully open and expel remaining residue. When the immune system is functioning well, it is more likely that the body will a) be able to extract and assimilate vitamins and minerals from the foods we eat, and b) not run into deficiency issues, thus operating more efficiently. Many of these sauna units are wooden, structurally sound eco-friendlyndly in the materials used for their construction. They are operated by electricity and vary in complexity, offering temperatures up to 160F. Check with your healthcare practitioner if this kind of treatment is safe for you, find a nearby spa and treat yourself to 60 minutes of relaxing music as rays penetrate your skin to do their work. You shan’t regret it! There are various types of saunas, so it was difficult for me to choose the right one for me. Thus, I invited suggestions from my friends, apart from reading blogs and articles, and it helped making a right decision much easily.